Canada’s auto industry was built on Free Trade commencing with the 1965 Auto Pact, the principles of which were entrenched the Canada-U.S. Free Trade Agreement and thereafter the North American Free Trade Agreement (NAFTA) followed by Canada. Being amongst the largest multi-national companies in the world, CVMA member companies are looking aggressively to participate in new and emerging global markets. As such, trade policies must ensure that domestic companies receive, on an equivalent basis, the same opportunities to compete fairly in foreign markets as non-Canadian companies have coming into our domestic market. Support and enhance Canadian industrial and commercial strengths by focusing on opportunities that respect the realities of deep North American integration. These realities drive investment decisions in Canada as well as the development of harmonized vehicle standards. Remove market-distorting non-tariff barriers in advance of tariff reductions; create a level playing field for Canadian companies by. Rules of origin must fully consider the auto industry’s strong historical and ongoing deep reliance on sourcing within North America. The progression of North American free trade agreements has facilitated a deeper integration of the North American auto sector and this will continue going forward as companies rely on existing manufacturing footprints and sources of inputs. Strong and enforceable currency disciplines to ensure that market access provisions in the final agreement are not undermined by a country’s inclination to manipulate its currency given the intersection of trade and finance. 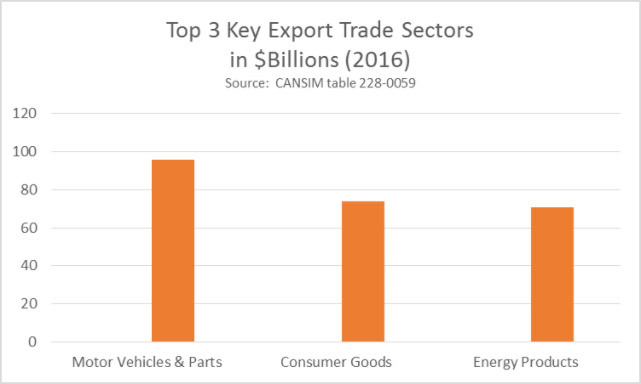 In 2016, vehicles were the top Canadian export valued at $63 billion of which 97% was exported to the U.S. The significant investments that Canada’s existing automakers have made—and continue to make—to Canada’s economy and manufacturing sector. The fact that those investments were made in the context of an integrated North American marketplace. Adjusting for new opportunities outside of North America will take time. CVMA and its members will continue to contribute to the discourse with the government of Canada on trade agreements such as the CETA, NAFTA and other bilateral agreements to ensure Canada’s auto industry is accorded the full economic benefits of expanded international trade.